THE MANUFACTURING PROCESS OF PREMIUM CIGARS EXPLAINED. The manufacturing of a premium hand-rolled cigar, consisting 100% of choice tobaccos, comprises countless steps. From the cultivation of the tobacco plants, through harvesting, storage, manual production and finally marketing, complete control of each individual step are taken care of by the manufacturers. Just as a fine wine is made from different varieties of grape, cigars are blended using tobaccos from different places, varieties and years. As with wine, so for tobacco growing, the nature of the soil and the location play an important part. 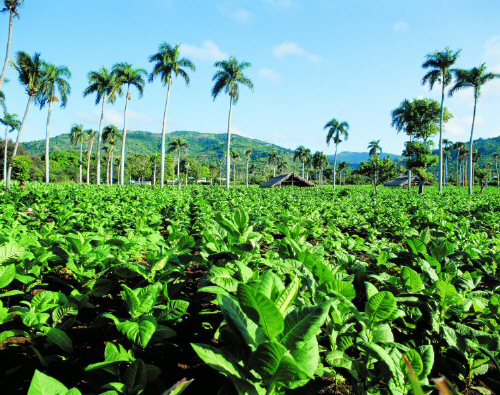 Cuba and the Dominican Republic are some of the best places for growing tobacco and stands out for its lush vegetation, the fertile soils and the perfect climate for growing tobacco. 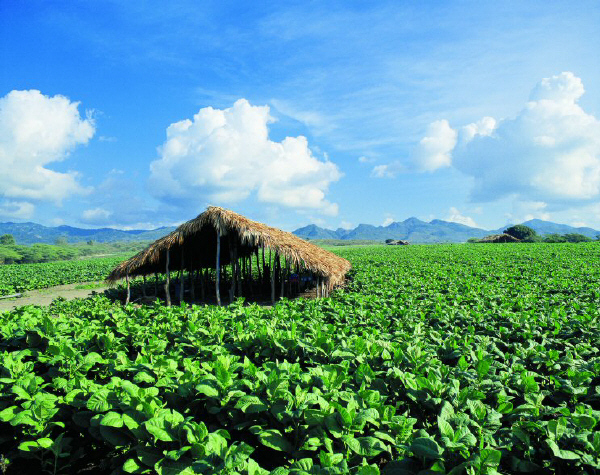 Tobacco has been cultivated in these countries since as long ago as the 16th century. Tobaccos for premium cigars are grown in the best locations, chosen by experts, with special, light sandy soils and a particular microclimate. 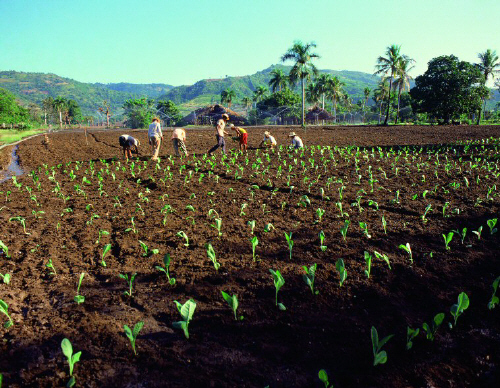 The tobacco seeds are sown in specially prepared seedbeds and covered with rice straw in order to retain the moisture in the ground. The seedlings need great care and daily watering. 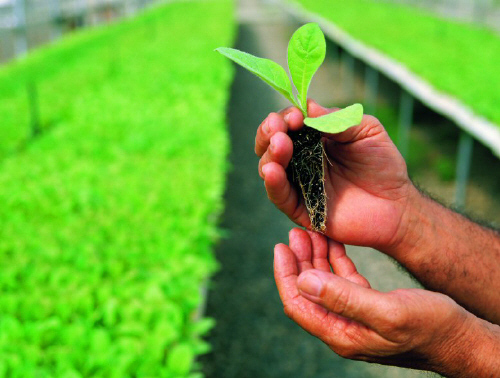 40 to 45 days later the healthiest and sturdiest plants are transferred to the actual tobacco fields. Here, they are watered regularly. The weeds are pulled out in order to allow the best possible, even growth. Side-shoots and flowers are removed to obtain tobacco leaves that are as large and strong as possible. Harvesting lasts for several weeks. The mature leaves are harvested in four or five successive pickings, always working from the lowest leaves upwards. The tobacco leaves are separated and classified by grades according to the height on the plant at which they were picked. This is done because of the different aromas and the varying nicotine content of the leaves, which increases from below upwards. This is of great importance for the creation and constancy of the tobacco blends. The leaf grades, from below upwards, are named as follows: Volado, Seco, Ligero and Picadura. Top brands of cigar manufactures only uses the superior leaf grades: Seco and Ligero. 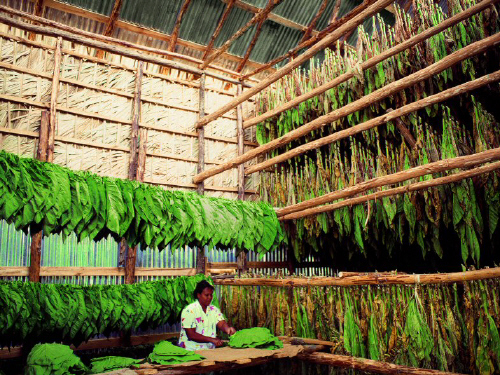 Immediately after the harvest, the leaves are tied together carefully in bundles and hung up directly in the fields in the tobacco sheds, better known as ranchos, to dry naturally in the air. Drying normally takes 45 to 60 days. 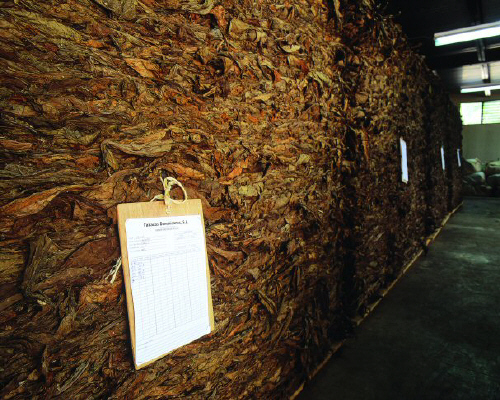 In this process, the moisture content of the tobacco leaves is reduced from 80% to around 20%. During this period, the first natural maturing processes already occur and the colour changes from green to tobacco brown. On completion of this phase, the leaves are gathered together in the ranchos in piles and constantly dampened slightly. Here, a sort of pre-fermentation takes place, which leads to uniform colour and fine texture in the leaves. After an initial quality inspection and selection of the tobaccos, it is taken to the warehouse for the actual fermentation. This process requires extensive specialist knowledge and many years of experience. The binder and filler leaves are piled up separately in layers and moistened at the same time. As a result of the fermentation, heat is generated and must be monitored constantly. When a specified temperature is reached, the pile is restacked. This process is repeated several times, until the main fermentation process is largely completed. The leaves are now moistened, the ribs removed, dried , and piled up again in layers for final fermentation. Depending on the type of leaf, the entire fermentation takes between 60 and 210 days. The fermentation process has a considerable influence on the aroma and taste of the cigar and on the way it burns. After that, the tobaccos are sorted by leaf grade, growing area, tobacco variety, year of harvest and farmer, packed into cartons and jute bales, and stored. The tobacco continues to mature during this period, acquiring its special, fine nuances of taste. Premium cigars consist of a balanced blend of selected tobaccos. The tobacco specialists, the so-called “tabaqueros”, have their own formula for each brand and line of cigars, which they harmoniously match to the respective cigar format. 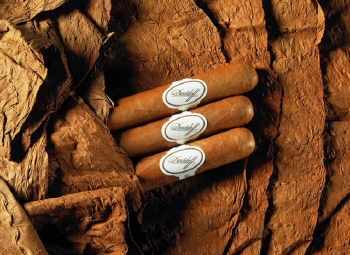 In this way, each cigar is given its very own, unique character which distinguishes it apart from its length and ring gauge. Blending takes place according to tobacco leaf grade, growing area, tobacco variety and year of harvest. The choice of the best wrapper leaves is also important. Cigar manufacturers strictly inspect the wrapper leaves in terms of their texture as well as colour and then ferments them specially. The fine art of blending, which requires extensive training and above all a great deal of experience, guarantees aroma, flavour and burning characteristics of a consistently high quality. 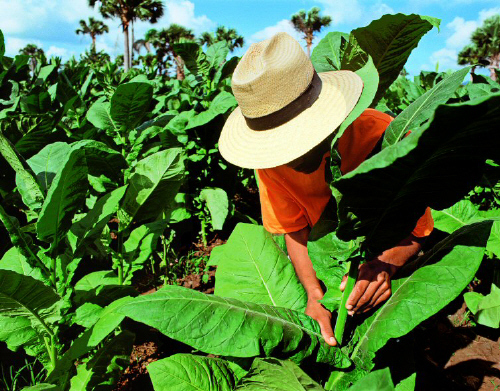 The process of bunching is the combining the filler leaves (tripa) of tobacco (from 3 - 5 varieties and sometimes even more) and then covering them with a binder leaf which is referred to as “capote”. 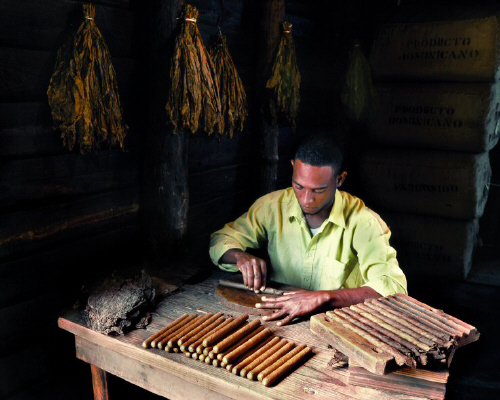 Cigar rollers, better known as torcedores, then bunch the tobacco leaves before the cigar is placed in the cigar mold (moldes in Spanish) and pressed. 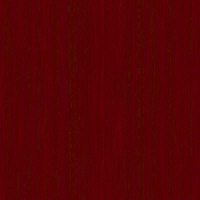 The pressing varies according to the cigar format, and is then given its firm shape by means of a hand-press. This technique is used when each of the tobacco leaves are rolled up like a small scroll before being bunched together. The accordion bunching technique is applied when the leaves are folded in a shape that resembles that of an accordion. This technique is used when the leaves are placed on top of one another and then folded like a book before it is bunched. The Lieberman bunching technique is similar to that of hand rolling a cigarette but this rolling machine is much bigger than a cigarette roller. The different tobacco leaves are placed on top a canvas and then rolled with the assistance of the Lieberman machine. This technique is machine assisted but is still considered to be hand made since is done by hand and not completely by a machine. Selected, skilfully cut wrapper leaves are rolled around the filler and the binder leaf, using exactly the right pressure. Great care is needed during these steps to be able to guarantee an even draw when smoking. Finally, the cigar head is formed skilfully from the same piece of wrapper leaf, and the cigar is cut to the desired size. Anyone who has once followed a cigar as it takes shape in the hands of a torcedor knows what a difficult craft it is that they have mastered. 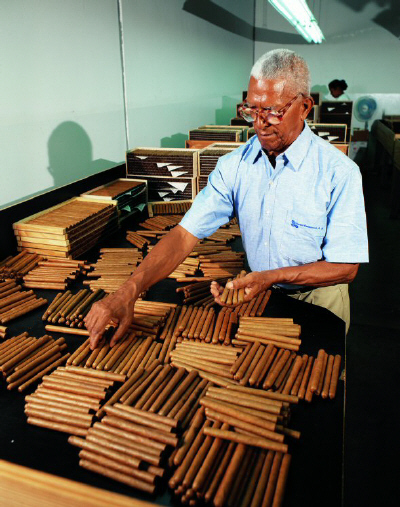 The process of making a cigar is accompanied by strict quality controls. The master cigar rollers and their quality assurance teams check the cigar for shape, finishing of the cigar head, weight and the appearance of the wrapper leaf. Before packing, selection for colour takes place – a further stage in the control system – followed by the application of the band, and also wrapping in cellophane when applicable. The cigars are dispatched by air freight to the distribution centres around the world. 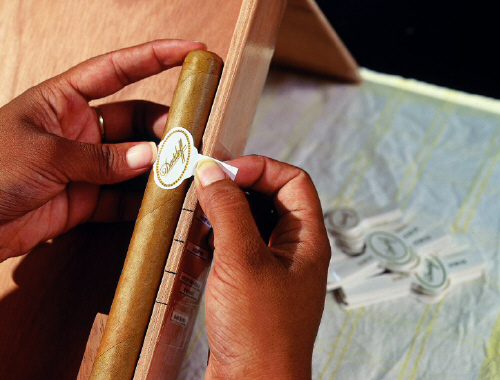 At these locations, final quality control now takes place before the cigars are packed into boxes or cases and provided with the numbered quality seal. Thanks to this seal, the path of the cigar can be reconstructed exactly, and perfect quality in the humidor at the merchants guaranteed. Here, great importance is also attached to a closed climatic chain. The cigars are stored and transported at 18 to 20°C and 70 to % relative humidity. The comprehensive quality assurance measures, which are constantly optimised, ensure the superior quality standard of premium cigars. Tobacco was grown long before 1492 by the original population of America, especially in the Caribbean area. From what is today the Dominican Republic, the plant started its journey around the world aboard the ships of Christopher Columbus. Meanwhile, there are many different varieties of tobacco, cultivated specially for particular growing areas and purposes. Tobacco – like grapevines – is one of those plants that have a rich tradition of being cultivated to give pleasure. This article was adapted from information supplied by the Oettinger Davidoff Group. 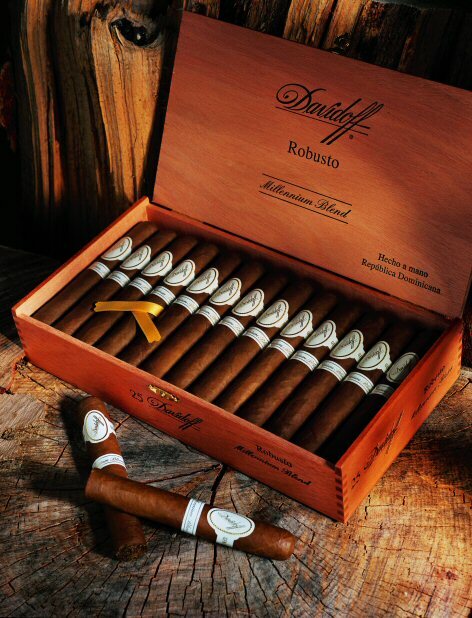 Pictures used with permission of the Oettinger Davidoff Group.